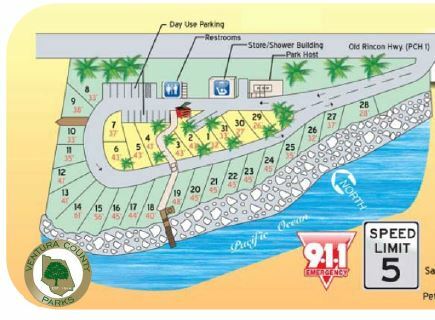 Hobson Beach Park is located North of Faria Beach Park and the Rincon Parkway. Similar to Faria Park, Hobson Park is wedged between the Pacific Ocean and the base of the Santa Ynez mountains along Highway 1 off the Ventura Freeway. The views of the Channel Islands are exceptional, and are most notable at dusk. This park is footsteps away from the Pacific Ocean. Dogs Dogs allowed on 6-foot maximum leash: $1.00 charge per dog.